Advent will soon be upon us, which means many things, among which is the annual fight--a polite one, no doubt--over who gets to sing the incipit (opening phrase) to the solemn version of Alma Redemptoris Mater. Coming to York this Advent! The Original Post on NLM has a splendid version of the solemn tone sung to Ambrosian Chant. I can now confirm that the Solemn Mass on 25th October at English Martyrs' Church, will be in the Extraordinary Form. This Mass will be offered by Fr William Charlton, currently based at English Martyrs. Fr Bill is being very supportive, and is publicising the Mass within the parish as part of its October Devotions to the BVM. It would be wonderful if we could reciprocate with a strong show of support in numbers attending! We have also received permission from the authorities at the Museum Gardens to sing Vespers there again. This will take place on 16th November at 3pm. The Schola Cantorum of the Rudgate Singers will sing here, before singing at the Missa Cantata later that day at English Martyrs. If you’re in York that afternoon, please do come along. I've already mentioned this on my own blog, but see no reason why it shouldn't be mentioned here as well, even if it's not yet been decided whether it will be in the Extraordinary Form, or the Ordinary Form ad Orientem. There will be a solemn Mass in honour of Our Lady at English Martyrs' Church on 25th October at 3.30pm. The music will be the Gregorian Chant Proper for Masses of the BVM, Josquin's Messe Ave Maris Stella, Guerrero - Ave Virgo Sanctissima, Rivafrecha - Anima Mea, and concluding with the setting of the Solemn Salve Regina written for the Monks of St Mary's Abbey in York. Needless to say, I'm delighted that we've been able to bring a full scale Rudgate Mass to York, as several of us live here. It's only taken 12 years - let's hope it doesn't take as long for the next one! I was tempted to claim that it would be the first fully polyphonic Mass in a catholic church in the city [in either form of the Roman Rite] for several years, but that wouldn't be true as another group of singers, largely from English Martyrs' Parish, some of whom have also sung with us, sang Palestina's Missa Aeterna Christ Munera back in June for the Patronal Feast Day of the Diocese, an excellent Mass in the Ordinary Form - the best I've ever witnessed in York. We need more groups like this, especially in this part of England. It's a subject I intend to expand upon in my own blog, so I won't say any more about it here. What I can justifiably claim is that it will be the first such Mass with full Gregorian Chant Propers! Such opportunities as these do not come along very often in York unless you want to pay to hear such music in a concert as part of the Early Music Festival perhaps. If you're in the area, or even if you're able to get to York by train/coach for the day, then I urge you to come to the Mass. It will be an unforgettable experience! I'm also waiting to hear from the Museum Gardens about the Schola Cantorum singing in the grounds/ruins of St Mary's Abbey. I've asked for 19th October, as this should give us enough singers for this event, and also for the monthly Mass in the Extraordinary Form which will take place in English Martyrs' Church later that evening. This may now have to change, as we've now penciled in a rehearsal for the polyphonic Mass that afternoon. We could of course sing another part of the Office earlier in the day. Wait and see! The Schola are singing Compline again at St Mary's Bishophill this Friday at 8.00pm. If you're in the area, do come along and say hello! 6th: Low Mass, English Martyrs, York. 20th. Missa Cantata, English Martyrs, York. Are we in this Diocese going to do anything to commemorate the 1st anniversary of the Moto Proprio? Suggestions welcome in the comments box! It was a great pleasure to see several people from the Middlesbrough Diocese at Westminster Cathedral last Saturday. Amongst the 2,000 who attended the Mass, I saw at least eight people who attend the traditional Mass at York. All had made their way independantly, by coach, train or car, to London. So Middlesbrough Diocese was well represented. Leeds Diocese did even better with a full coach from the parish of Allerton Bywater alone. And there were coaches from other areas as well. I noticed the one from Cornwall. 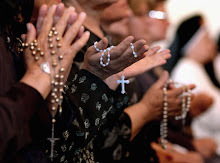 To read reports of the Mass and of what Cardinal Castrillon Hoyos had to say, I suggest that you look at some of the better known blogs, such as Holy Smoke, The Hermeneutic of Continuity and New Liturgical Movement. It was a day to be remembered. The blogosphere is alive with reports of the celebration of the Feast of Corpus Christi in Rome. New Liturgical Movement probably gives the best coverage but Fr Zuhlsdorf also covers it. Most notable is to see everyone who receives Holy Communion from the Holy Father kneeling at a pre-dieu, and receiving on the tongue. Of course, at every Mass there is the option for anyone to receive Holy Communion kneeling and provision should be made to make this possible. However, in practically every church in England, no provision is made for this. I notice that almost all priests stand on the floor of the nave rather than in the sanctuary to give Communion; thus denying the possibility of the faithful kneeling on the altar step. Most people who have passed middle age find difficulty kneeling on the floor (and getting up again) in any dignified manner. A pre-dieu (or better still an altar rail) would solve this problem. 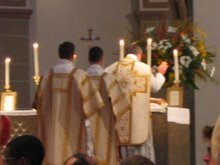 Maybe, the example set by the Holy Father and by the congregants in Rome on the Feast of Corpus Christi, provides the opportunity to review the manner of the reception of Holy Communion in our parishes. Perhaps now would be a good time to request our parish priests to make provision for the faithful to receive body of Christ whilst kneeling. YCA now have a blog for information on new events, including their upcoming retreat at Douai Abbey between 4-6 July. Mgr Antony Conlon, the LMS Chaplain, will be celebrating Mass in the Extraordinary form for YCA on 6 July. Douai Abbey is a bit of a long journey from the diocese but well worth it if you can get there. A reminder that, at the invitation of the Latin Mass Society, Cardinal Castrillon Hoyos, President of the Pontifical Commission, Ecclesia Dei, will be visiting London on Saturday 14th June. He will address the annual general meeting of the Latin Mass Society which will be held in Westminster Cathedral Hall at 11.00am. At 2.00pm, he will be the celebrant at a pontifical High Mass in the usus antiquior at the High Altar of the Cathedral. He will also preach. His Eminenence will process into the Cathedral wearing the Cappa Magna which is a rare sight nowdays. The occasion will be a landmark in the progress of the campaign to restore the ancient form of the Mass to our churches; and is expected to attract a large congregation. Hopefully, this will include a sizable contingent from the Middlesbrough Diocese. I already know of four people who are going, but we would like to get a coach load. If you would like to share transport, please telephone 01757 638027 or e-mail waddington@ gooleboathouse.co.uk. God bless all your good intentions.Say hello to all the friends over there. The Pontifical High Mass celebrated by Cardinal Castrillon Hoyos at Westminster Cathedral on Saturday 14th June will be a major occasion; and an opportunity to demonstrate the strength of the demand for the return of the traditional form of Mass to our parish churches. A hugh congregation is expected with many travelling from the north of England. It is possible that a coach could be hired to take people from Yorkshire. Alternatively, arrangements could be made to share cars. Which ever way it is done, it is important that a sizable contingent heads south on the day. Anyone interested in coordinating transport is invited to leave a comment. There is to be another Mass in the usus antiquior at Scarborough. Fr William Charlton will again be saying a Low Mass on Wednesday 16th April at 7.30pm in St Peter's Church. Last time there was a very impressive congregation of about 150. There is a picture of the sanctuary in the post dated 24th January. It is a very fine church and very suitable for the traditional rite. Please spread the word around. 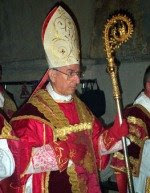 The Latin Mass Society is proud to announce that Cardinal Dario Castrillon Hoyos, President of the Ecclesia Dei Commission in Rome and Prefect Emeritus of the Congregation for the Clergy, has accepted its invitation to celebrate a Pontifical High Mass in the Traditional Latin Rite (the Extraordinary Form) in Westminster Cathedral on Saturday 14 June at 2.00 pm. Cardinal Castrillon Hoyos is one of Pope Benedict XVI’s closest collaborators and is charged with oversight of the Vatican’s relations with the religious communities and laity committed to the Extraordinary Form of the Roman Rite. Cardinal Castrillon Hoyos will arrive in London on Friday 13 June in time to attend a private dinner given in his honour by Mr Julian Chadwick, Chairman of the LMS. The LMS hopes to arrange for Cardinal Castrillon Hoyos to call on Cardinal Cormac Murphy-O’Connor, Archbishop of Westminster, at Archbishop’s House close to the Cathedral on Saturday morning. Cardinal Castrillon Hoyos will then deliver an address at the LMS’s AGM in Westminster Cathedral Hall later in the morning. He will then take lunch with the LMS’s Committee members before celebrating Mass in the Cathedral at 2.00 pm. As befits a Prince of the Church, Cardinal Castrillon Hoyos will be welcomed at the Cathedral west door in full cappa magna before processing to the Blessed Sacrament Chapel to pray; he will then vest in the sanctuary whilst the Cathedral choir sings. Pontifical High Mass will then be celebrated at the High Altar with all the breathtaking ceremony and music integral to the Traditional Rite. Cardinal Castrillon Hoyos will also preach. 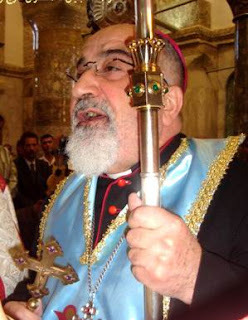 It has been reported today that the Catholic Archbishop of Mosul, Paulos Rahho, has been kidnapped by gunmen. Three of his aides were murdered during the kidnapping. Please keep the Archbishop in your prayers at this time. Please make cheques/postal orders payable to the LMS. They will then forward the money to Fr Mwongera. Bishop Kevin Dunn of Hexham & Newcastle Diocese is currently critically ill in hospital suffering from pneumonia. Staff at the hospital are doing everything in their power to help the bishop. There is to be a pilgrimage to Lourdes lead by Fr Hudson of the Institute of Christ the King. It is from 26th October for four days flying from Liverpool. The cost is in the region of £500. I'm indebted to David Little for taking these superb photos and posting them on his own site. They're from the Historical service of Vespers which the Schola Cantorum sang last September - historical insofar as we sang the solemn setting of the Salve Regina written specifically for the Abbey AT the Abbey for the first time in nearly 500 years! And Now, for something slightly different. Not too drastic though, as it's still Gregorian Chant! Having over -sung the Missa Orbis Factor in recent times, I've decided to give our little Schola something else to sing this weekend. As it's Quinquagesima, I've discounted Missa de Angelis as it's far too festal in nature [in my opinion anyway! ]., and it also overdone, more so than Orbis Factor. I've come across people - who ought to know much better - who think it's the only chant Mass there is, as it's the only one 'they know'! So, what Mass to sing? Answer: Mass IV, or to give it its proper title, Cunctipotens Genitor Deus. I heard this sung for the first time in nearly 20 years by the wonderful monks of the Canons Regular of the New Jerusalem over in West Yorkshire on the Sunday after Christmas. quite frankly it's stunning, so that's what we're going to do, minus the Gloria of course, as it's Septuagesima Season. For those of you able to come along to English Martyrs' Church this Sunday evening, we are also going to sing the Propers, Credo I [not III, again most people I know seem to think that Credo III is the only one that exists. Credo I is actually the setting that should be used most Sundays. There are, to my knowledge, 7 - yes, seven, chant Creeds!] the Ave Maria, Anima Christi and the solemn setting of the Ave Regina Coelorum. We still don't have a regular organist. Please let me know either via the Rudgate or Middlesbrough LMS links on the right if you can/would like to play or know of someone who could. We would be most grateful. Whilst on the subject of volunteers, if there are any Tenors or Altos reading this who fancy singing, then again I should be grateful if you could get in touch via the aforementioned links. The Mass at Scarborough yesterday evening was a great success. There was a congregation of at least 150 which made the church of St Peter look quite full. Fr Charlton celebrated a votive Mass of the Apostles, so we had red vestments, which looked very well on the superb sanctuary at St Peter's Church in Scarborough. The parish priest, Fr John Loughlin had temporily removed the modern "versus populum" altar which normally stands at the foot of the altar steps, allowing the sanctuary to be seen to full advantage. The high altar is made of white stone and is of a good size. Behind it is an elaborate reredos incorporating the tabernacle and monstrance throne. On the wall behind and above are spectacular paintings reaching up to the high ceiling. The three altar steps are of white marble and the sanctuary is spaceous. It was most pleasing is to see that the stone altar rails, complete with gates, had been retained. We are looking into the possibility of another Mass after Easter. Now you won't hear this very often... In Today's Guardian Newspaper there is a splendid double page colour photograph of Pope Benedict celebrating Mass ad orientem in the Sistine Chapel. JUVENTUTEM KENYA,WORLD YOUTH DAY 2008 FUNDRAISING CAMPAIGN. Receive Christmas and New year greetings from Juventutem Kenya Members. Juventutem Kenya is a group of young kenyans,catholics aged between 15 and 36,who are interested in the Extra-ordinary rite of the Mass and other traditions of the Roman Catholic Church.It was founded by Rev.Fr.Charles Mwongera,who after attending the Juventutem 2005 in Germany for the WYD,came with the good idea. We are affilliate member of the International Juventutem Federation. After many struggles and challenges to get the young people who are COMMITTED,we are proud to have around 20 who are serious.We are able to meet occasionary and pray together.Still we have problems with the Latin language because we have never studied Latin in our Schools here in Kenya. Now,we are interested in joining the rest of the Juventutem from other countries all over the world for the WYD,Sydney 2008. We are humbly appealing to well wishers both locally and internationally to help us so that afew of us can travel to Australia next year July for this holy Pilgrimage. The most intimidating challenge remaining is geting the money to care for the AIR TICKET. According to the International Airlines,Route,NAIROBI-SYDNEY,the cost of the lowest economy class,Return Ticket is around 2,500 USD,or 1,300 Sterling Pounds.This you can confer from the international carriers like,Virgin Antlatic,Kenya Airways,Emirates,KLM Royal Dutch and others. May God continue to bless us all and remember each other in prayer. If you would like to help please mention in the com box and I will see what can be done. There is to be a Low Mass in the usus antiquior at the church of St Peter in Scarborough on Wednesday 23rd Jan at 7pm. Fr Charlton will be the celebrant. This Mass has been arranged by the Latin Mass Society at the invitation of Fr Loughlin, the parish priest. Depending on how many attend,we will decide whether there can be a regular Mass in the old rite in Scarborough.